Third pro women Carla Rooijen is off the bike - 30:22 behind Yvonne van Vlerken. Through 6.7 km of the run the lead of Yvonne van Vlerken is 7:43 over Sarissa De Vries. 15 km to go for Bas Diederen - and still a lead of 5:50. Bas Diederen leads by 7:21 over Marl Oude Bennink at Km 31. At +10:36 is Alberto Casadei, at +13:23 is Tim Brydenbach. Half marathon for Yvonne van Vlerken - 7:54:33 race time. She leads by more than 10 minutes over Sarissa De Vries. The gap between Bas Diederen and Mark Oude Bennink is +8 minutes. 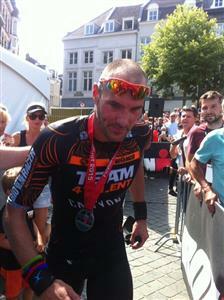 Bas Diederen is flying through the town - he is coming! 15 km to go for Yvonne Van Vlerken. Through 27 km of the run the gap between Yvonne van Vlerken and Sarissa De Vries was 15:54 minutes. Yvonne is on the final 10 km. 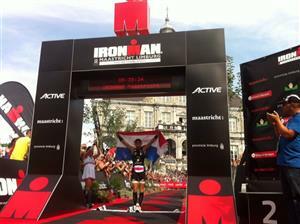 6 kilometers for Yvonne van Vlerken - she is on the way to the 6th IRONMAN win of her career. They were not as fast as men's winner Bas Diederen, but the Maastricht University Team had a great one today. 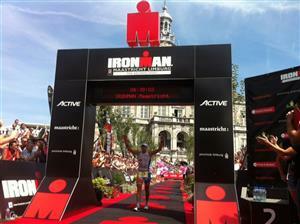 They won the team relay in 8:35:48 thanks to these splits: swim 48:08 / bike 5:01:05 / run 2:42:07. Congrats! Final 3 km for Yvonne van Vlerken! Finish line, here she is: Yvonne van Vlerken! 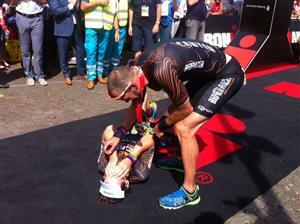 9:39:24 - Yvonne van Vlerken wins the inaugural IRONMAN Maastricht-Limburg! 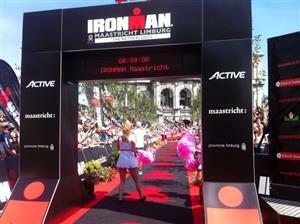 Sarissa De Vries is on the way to the line - second place in her rookie IRONMAN race.